The Honourable Governer of Kerala Shri. Justice(Retd.) 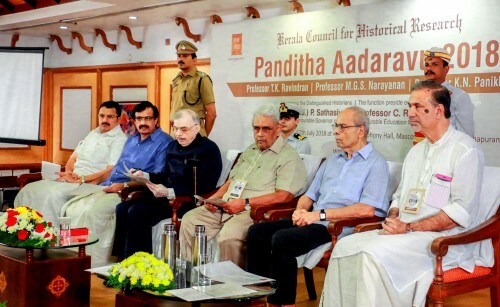 P. Sathasivam honoured three distingushed historians T.K Ravindran, M.G.S Narayanan and K.N Panikkar as part of the programme ' Panditha Aadaravu 2018' organised by Kerala Council for Historical Research(KCHR) on 12th July 2018, at Symphony Hall, Mascot Hotel, Thiruvananthapuram at 4.00pm.